It’s been about 2.5 weeks since I ran the marathon, so I thought I’d better get these thoughts written down before I lost them completely. 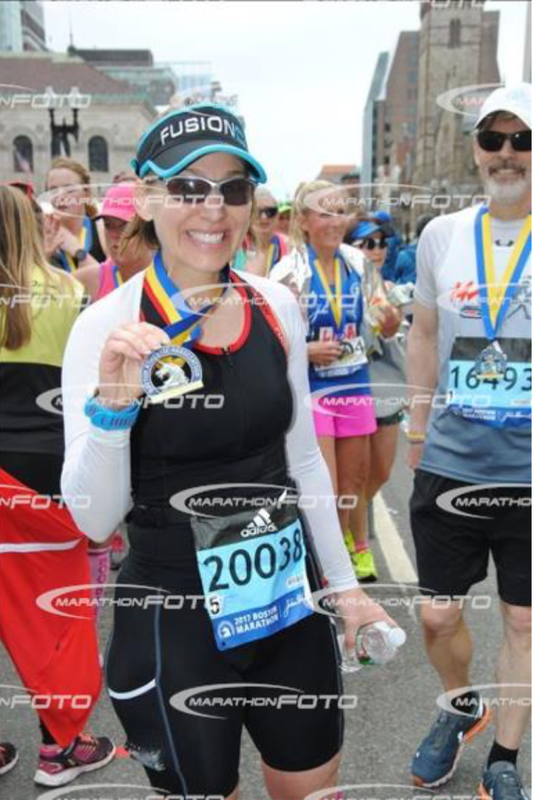 Once again, the Boston Marathon lived up to the hype. It was a 26.2 mile parade into Boston, with people cheering almost the entire way. I do remember a moment around mile 8 or so, where it was quiet, just a lot of hot sweaty people running and breathing. Every other moment I was surrounded by a cacophony of cheers and cowbells. I left my hotel room with plenty of time for a casual walk to the buses at Boston Common. The morning was already warm, so I didn’t need any throw away clothing. I was meeting my family at the end of the race at the family meet up area, so I didn’t have a gear check bag. We were only allowed to bring a small bag onto the bus, about the size of a gallon zip lock bag. In mine I had, a space blanket I kept from RnR DC half marathon, a clif bar for second breakfast, a bottle of water, and my on course nutrition (gu chews and base salt). In Hopkinton - Thanks MarathonFoto! around on me so I've had to hunt down photos. I boarded one of the waiting yellow school buses and grabbed a seat next to a friendly looking lady :D We ended up chatting the entire trip out to Hopkinton about families, working from home, Common Core pitfalls, running clubs, etc. 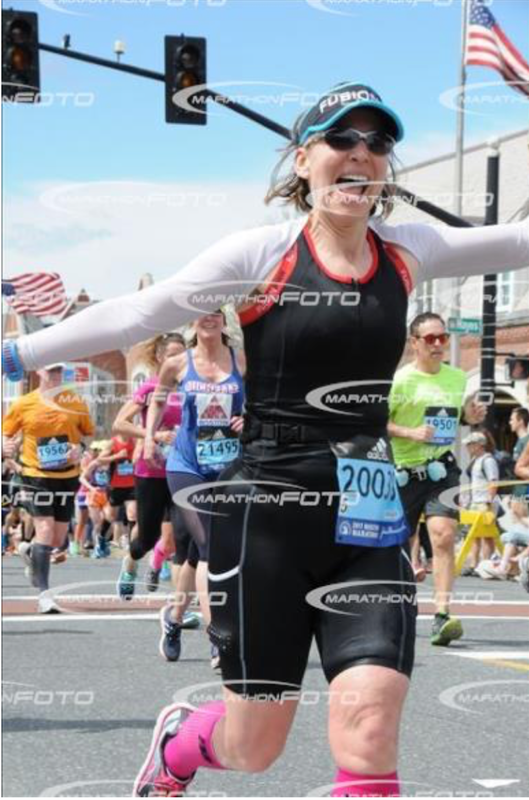 She was awesome, and basically who I want to be in 9 years (she was 9 years older than me and running her best times ever in the marathon distance). Once we arrived in Hopkinton, I found an area under a tent and took a little break laying on my space blanket. Eventually I needed to pee so I stood in line for the porta-lets. While in this line, I did more chatting with folks, but also noticed how the sun was beating down on us. The medical folks were walking up and down the lines offering sun screen. It soon became apparent that it was much hotter than the advertised 62 degrees. Later reports said the temps at race start were closer to 75. Once I’d finished my business, I went back under the tent, grabbed a banana from the food table and sat down to eat a banana and a bit of my clif bar, this was about 75 minutes before race start. At this point, I only sipped on water, so I wouldn’t have a sloshy stomach. As we were walking to the race corals the heat became more and more prominent in the chatter around me. I was wearing my arm coolers, so I grabbed water from the folks just outside the corals to pour over my arm coolers, I soaked them, however with the amount of people around me and lack of breeze, they didn’t start cooling, until mile 5 or so. The start was CROWDED and HOT. I could smell the running humanity around me, and there was no break in the wall of runners. You were running the pace of the people in front of you, no other choice, unless you wanted to waste energy by dodging around folks – not the best idea with 26 miles to run. At this point, as I started the third mile and was at an 8:20 average pace because of the crowds, I realized that it was the perfect situation for a hot day like this. I made sure to take a sip of water and dump water over my head and down my arms at EVERY aid station. Boston has aid at EVERY MILE MARKER. I stayed on top of my nutrition and took in salt about every 30 min. It was hot, and folks were not prepared for it. People started walking around mile 9. Several times, I stopped to help someone who was cramping and share some of my salt with them. Side note: There were plenty of mom’s to be out there that had qualified fast, and they were taking it slow. They had great signs on their backs to let you know they were moms to be and would be stopping at aid stations, etc. Way to go ladies!! The opening towns passed in a blur, and eventually I was in Wellesley. I could hear the screams before I could see them, a wall of people on either side of the street with funny signs and hands held out for high fives! I ran down the right side with a high five for all. Awesome. Big smiles on my face. Miles 13 – 15 felt like they took a long time, and right now there isn’t much I remember about them. I think it was during this time that I grabbed some ice being given out by a spectator and tossed it down the front of my top and heard a guy exclaim, “that’s crazy she just put ice down her shirt!”. The ice felt great but also melted almost immediately. Around mile 16 or so, I grabbed a Cherry Popsicle that someone was holding out from the side of the road. It tasted like HEAVEN! So cold, YUM, and not too sweet after the chews that I had been eating. This is how the crowds make you feel! When the hills started, I took them slowly on purpose. I was really worried about how hot it felt and didn’t want to blow up in the hills by going too fast. I was also tracking my time on my watch and realized if I STAYED SMART I could finish around 3:40. Given that I had started the day wanting to run at least 3:35, it might seem that 3:40 would be disappointing. But I was more excited that I had adjusted to what the day brought me and had run a smart race, I had finally left my ego at home and as I was feeling good at mile 18-22, I was reaping the rewards! I saw my husband and BFF at around mile 22? (They would know that better than me) and at that time I was in a good zone, however I was just getting over some stomach cramping that caused me to miss a couple of “feed times”. This may have impacted me a bit at around mile 24 when the wheels started to fall off a bit, but part of me just thinks that no matter what you do, mile 24-26 is 99% force of will needed to keep you moving forward. I just kept telling myself that if I walked I lost all chance of running faster than 3:45 (the BQ time for “mature” women like me). I saw the CITGO sign in the distance and in the space of a few minutes went from “AWESOME!!! CITGO SIGN I’M ALMOST TO THE FINISH” to “Oh GOOD LORD, WHY ISN’T GETTING ANY CLOSER!?!?! ?” My legs were SCREAMING at me to stop, but it wasn’t that I didn’t stop, I couldn’t stop. In that moment, on that day, it wasn’t an option. Going much faster didn’t seem to be an option either, haha, but my brain really held up for me in those closing miles, I didn’t walk, I didn’t stop, I just kept running. So, what made that possible? I believe that it has a lot to do with the fact that I had belief in myself. From all the different races I’ve run, in all the different circumstances, I knew that I had what it took to finish that race. Also, importantly, I had SEVERAL long runs under my belt. Long runs in which there were times when I didn’t “have it” but when I stayed the course and kept my wits about me, things came around. Or they didn’t come around but I knew that I could hold an 8:30 pace without issues, if I just relaxed my shoulders and let the run come to me. 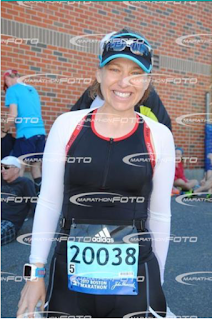 I just kept checking in on my form and breathing… really breathing and relaxing and just ran. 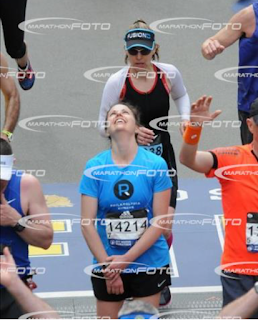 I have never been prouder at the end of a race. I’ve run fast marathons, 9 minutes faster in fact, but I’ve never had a smarter race, given the conditions of the day and I consistently pushed down the negative and found a way to reach my goal on the day. 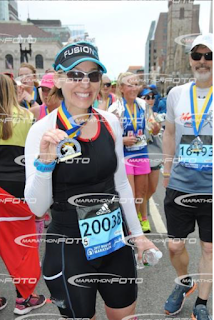 As I closed in on mile 26, I saw the stream of runners in front of me making that right turn onto Hereford, and I knew I was going to finish another Boston Marathon. There is no other feeling like the one you get as you make that right-hand turn and power up the LAST HILL. As I turned left on to Boylston street, the crowd was raucous. As I’m running in my narrow tunnel of awareness, I see a signed American Flag flap in front of my face. I look to my left to see a Veteran, running with a leg prostheses, carrying the American Flag to the finish line. I said to him “way to go! !” but it was drowned in the incredible volume of cheers that preceded him, as people would see him approach, on his run to the finish line. I ran on, towards that beautiful yellow and blue line, crossed it, and kept running, not yet understanding that I could, in fact, now stop. It took a second or two, but I did realize that I’d finished. I stopped my watch and was elated to see 3:41, which is a BQ and stands to possibly be fast enough to get me into the race next year. Big Smiles! I grabbed a water handed to me. Big Smiles! I received my medal. Big Smiles! They tied a space blanket around me. Big Smiles!! I started walking through the food line… ooh not feeling so good. I rounded the corner after food, heading to the family zone… not feeling too good. I started to cry because I couldn’t find the sign for where I was to meet my family. A nice volunteer asked me if I was okay. I told her where I was trying to go and she gently turned me around and pointed to the sign that had been to my left. The shakes had started and I felt SO COLD. Alex and Rachel found me and after a bit of standing around we started to head toward where my Mom and Dad were with the boys. Then I started to have severe cramping in my intestinal area, oh no!! Rachel asked me if I had any salt and I started to whine that it had all spilled out and pulled out the canister. She looked at it and said, no, there is a lot in here still. I swallowed all that was left. We sat on the ground and honestly about 5 min later, I felt better. I think I lost a lot of electrolytes out on course… my shoes had salt rings on them. We walked back to the hotel, about 1.5 mile walk, and by the time we got there I was starting to feel pretty okay. After a shower, I was still sore and moving slowly, but feeling much better. Food still sounded awful, but I could eat about 3 hours later. during race – every 15 min 1 GU Chew, raspberry for first half, black cherry (caffeine) for second half (the caffeine is probably inconsequential, but I think it works, so it does). Hit of Base Salt every 30 min. Sip of water every mile. I ended up missing a few chews… when I had the cherry popsicle instead, and when my stomach started to cramp towards the end, I thought I could make it the rest of the way without so I stopped eating chews. Wish I would have taken more salt. I may have been sweating more than I realized and my body had only experienced one “hot” run this spring. - Nutrition plan may still need tweaking – going to try a different chew see how my stomach feels, but this was by far the best my nutrition has gone in a marathon. - Going in to “meditation while running” mode helps me get through the down times. - There will always be a down time in a marathon, make sure you have the tools you need to handle it. - Fusion Gear ROCKS! No Chaffing and I was pouring water on myself the entire day. Loved the report, great race Jill, it sounds like you ran so smart. Great job! !